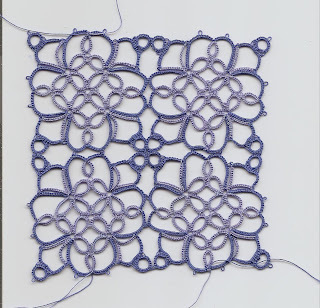 Once I had received my goodies I was keen to finish this square from the Iris Niebach book and start trying out the new threads and shuttles. So I tatted this despite loads of interruptions and distractions; from the dogs, who are both on heat, and Raphaël who is on holiday and therefore rather more demanding than usual, the cats, one of whom has tummy trouble, plus various visitors and phone calls. I am amazed, it's not top quality but I don't think I've actually made a mistake, and goodness knows it's quite a complex pattern. I love this motif, but I haven't tried it yet. I love the color! The lighter blue is Pamela's indigo and the darker is DMC. I have started a pink doily with the Lizbeth...can't wait to show you! This is very pretty. I haven't tried this one yet. That's a lot of interruptions. I'm afraid mine would look like thread ends wadded together! Oh-oh! Now I am scared! That looks so dificult! That would be - difficult!